5.5x2.5mm DC port output for compatible with Apple MacBook Pro 13 (all) MacBook Air 11 13 (all). 4USB Quick Charge Ports for compatible with Macbook Pro 13 15 Touch Bar (5V 2.4A Charge for Touch Bar only) New MacBook 12, Apple and Android tablets smartphones (USB Type C or 5V USB) and other devices. All products have passed CE FCC and ROHS certifications! Faster and safer charging with GISSARAL advanced technology. We use only premium materials and cutting-edge technology, to ensure complete safety. 18-month warranty and provide friendly, easy-to-reach support. Max Compatible: DC Port Charger for MacBook Pro 13 MacBook Air 11 13 MacBook (NOTE: The older MagsafeL Charging Cable NOT INCLUDED); Four USB Ports Charger for New MacBook 12 New MacBook Pro 13 or 15 (Note:5V 3A USB to Type C only,Not Support PD 20V) Apple or Android smartphones, tablets and USB C devices. High Capacity: Charges the MacBook Air 13 approach 2 times, iPad approach 3.5 times; iPhone 10 times and Samsung Galaxy approach 8 times. 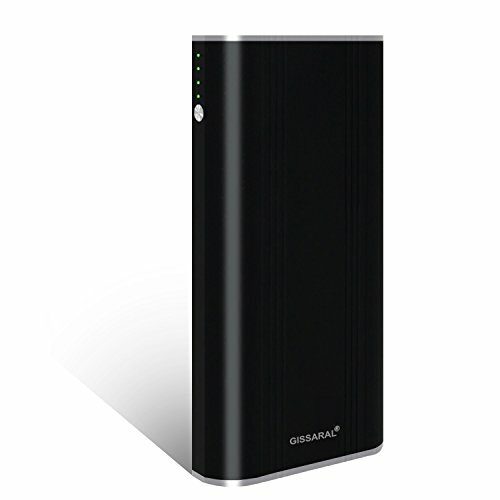 Safety and Fast Recharges: Around 2.5-3.5 hours full charge for power bank via the GISSARAL Adapter (packaging included fast adapter), around 10 hours with a 5V 2A Micro USB adapter or 5V solar charger. Charging Technology: Detects your device to deliver its fastest possible charge speed up to 4 amps with the DC Port and up to 3 amps per USB port or 6 amps through four ports. What's in the Package: GISSARAL Power Bank, Adapter, Magsafe2 T Charging Cable for MacBook Pro MacBook Air, USB to Type C Charging Cable for Macbook Pro Touch Bar and New MacBook 12, Manual. If you have any questions about this product by GISSARAL, contact us by completing and submitting the form below. If you are looking for a specif part number, please include it with your message.